Many SUVs and luxury cars come with air suspension systems. The purpose of the air suspension is the same as standard, coil-cover springs or gas-filled shocks and struts. They raise the chassis off the axle and cushion the vehicle against bumps and jarring movements. Air suspension uses a system of inflatable air bags which swell up with compressed air to raise the vehicle off the ground. And just like a standard suspension can develop faults or sustain damage that require repairs or replacement, an air suspension system can also get damaged. The air compression system is a more advanced suspension system. As such, it comes with certain complexities, such as a more diverse range of components, which are missing in standard suspension systems. One such critical component is the air compressor. Any damage to the air compressor can lead your car to develop certain problems like the compressor not starting or making abnormal sounds. And without the required suspension support, you may find your car is riding low. If the air compressor develops a fault, the chassis might not lift, or only partially lift, off the axle. This could then lead to the above-mentioned problems. The important thing is to identify the symptoms of a faulty air compressor so that a replacement can be initiated as soon as possible. Is Your Car Suspension Sagging? If there is a problem with the air suspension compressor, one of the first aspects you will notice is that your car’s suspension is sagging. Remember, it is the job of the air compressor to deliver the required compressed air to the air suspension system. Once this compressed air inflates the airbags, your car chassis gets the support it needs to raise the vehicle off the ground. If the air compressor develops a fault, this action might happen partially, or it may not happen at all. This, in turn, will lead to the riding height of your car becoming lower. Is the Air Compressor Generating Abnormal Noises While Operating? If the compressor is generating a loud grinding or clicking noise, it could be due to a faulty fan or motor. If left unchecked, the compressor will sustain greater damage and eventually stop functioning. 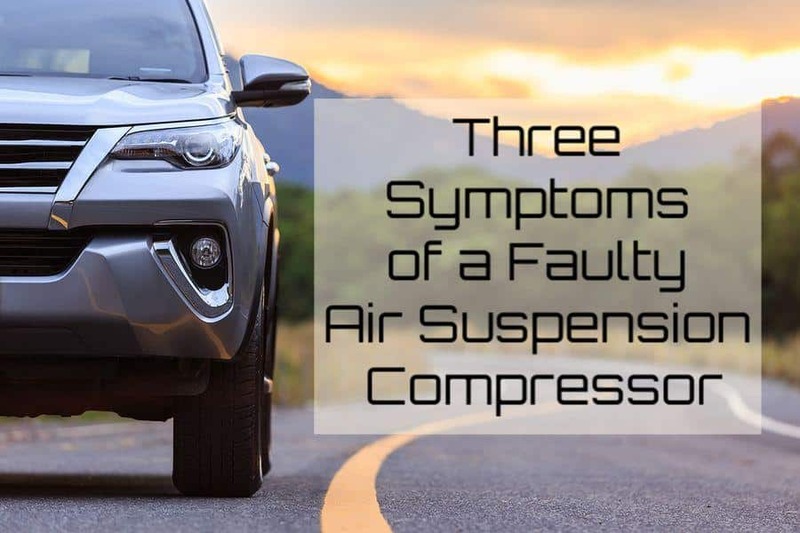 Without a working air compressor, the airbags will not receive the required amount of compressed air which means your entire suspension system will be left without the necessary support. Is Your Car Air Compressor Not Functioning at All? The air compressor turns on and off based on the requirements of the suspension system. The suspension itself is designed to self-regulate the compressor. Anytime your air compressor stops functioning completely, then it could be because it has completely failed, or it has developed a major fault. Without a working air compressor, the suspension system cannot function. It is dangerous to drive your car if the suspension system does not have the necessary support for a smooth and safe ride. If your air compressor is not turning on at all, it is best to have a professional mechanic inspect the system to assess if your car needs an air suspension compressor replacement, or if any other repairs are needed. As mentioned above, air suspension systems are not simple. It is not uncommon for these systems to give way without any kind of warning signs. However, if you notice any of the symptoms mentioned above, it is best to have your car checked up by a professional mechanic right away. Are your car’s shocks and struts worn out or damaged? Are you looking for professional car service for your car? Do you want servicing and repairs you can trust? Give Accurate Service a call today at 520-620-9129 or schedule an appointment online!